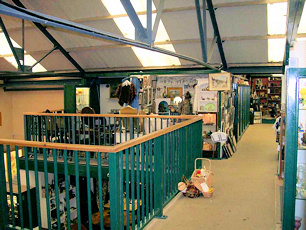 Elsecar Antique Centre situated in Building 18 of Elsecar Heritage Centre is on two levels. 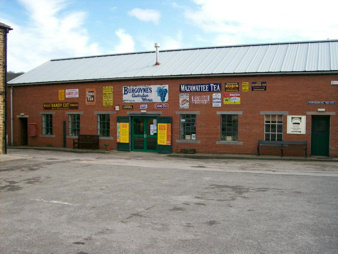 Home to over 100+ antique dealers, the building is split into separate units and cabinets holding a whole host of antiques and collectables ranging in price from 50p to £3,000. After entering through the foyer, you will find reception to your right hand side (photo below.) The reception is always manned by our friendly staff, always ready to help, please do not hesitate to ask for assistance. 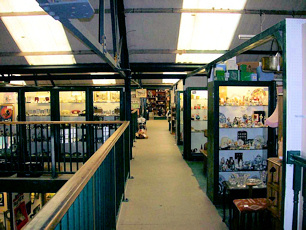 This photo shows the main area of the mezzanine level with its many units and cabinets. View from the mezzanine in the extension with the newly installed lift to the right hand corniner, and the new lower floor units. To view photos of specific units and cabinets please visit the next page. Please note that stock changes regularly and the items pictured are not a true representation of the goods on sale. For specific items please contact us for details of availability. 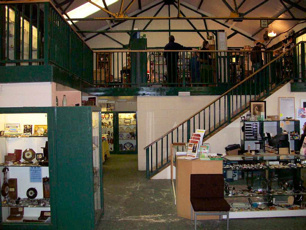 View from the entrance down the foyer. Coddswallop museum on the left closes on 15th January 2010. 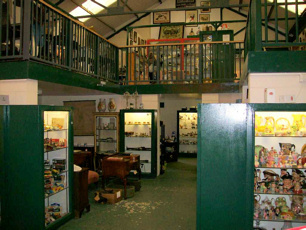 Displays will continue to be shown down the left hand side of the foyer, leaving the museum space (subject to building control) to house our new extension.